Yao Ming was far from flawless last night thanks to a defensive strategy change plus 16 fouls laced between Aldridge, Oden and Przybilla. The big man was clearly out of sync or at least taken out of sync by the Blazers 2-headed monster which we finally saw together on the court. The Rockets had other players step up including Von Wafer and then Aaron Brooks in the final minutes, but Portland's big guns were too much. Someone step over and take an f-ing charge on Von-ton. Mutombo going down leaves the Rockets incredibly smaller. In the Playoffs, you need star power and the Blazers are showing they have it. Joey Crawford is almost as bad as Steve Jaavy. Pretty incredible game when you look at the bottom line stats. Aaron Brooks will get his, it's limiting everyone else that matters. 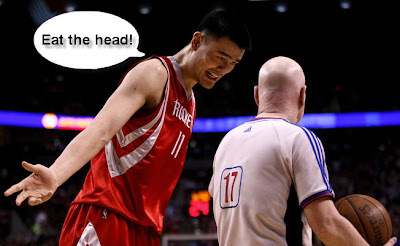 I kept thinking Yao and Scola were in foul trouble...somehow they weren't. Blazers offense still seems out of sync. Luckily Roy and LA weren't. Joel vs. Artest - keep this in mind as this series progresses. Tickets on sale at 10:00AM for game 5! Without tickets to this game, we scurried our way to Grand Central Restaurant and Bowl about 6:30 to grab a prime spot at the bar. The crowd had yet to arrive and we were actually a little nervous that this wasn't the right spot to enjoy a playoff game. Fortunately, by tip-off, the place had pretty much filled up and the bartender was kind of enough to finally change over every TV to the game. Reminder to all bartenders: watching the pre-game of a Blazers playoff game is a hell of a lot more important than playoff hockey. We all owe a ton of credit to a buddy of ours that showed up for the last few minutes of the 4th which coincided perfectly with the Blazers final push to secure the victory. Cheers. I told you I was superstitious.